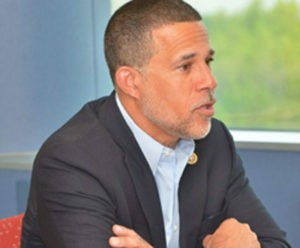 With over 50,000 federal employees, the fourth congressional district in Maryland represents the fifth largest number of workers, and Maryland likely counts as the third largest impacted state by the government shutdown, according to Democratic Rep. Anthony Brown. Caucus Chair Karen Bass (D-Calif.); Rep. Bennie Thompson (D-Miss. ), and Rep. Barbara Lee (D-Calif.), on a media conference call on Friday, Jan. 11. “At the end of the day, even if he had all the money, it would still take eminent domain to build his wall. That process will take years. This is further evidence that this is a fake crisis and, in my opinion, just an attempt to change our attention away from the numerous impending investigations,” she said.